The Routledge Critical Thinkers series is turning into something special. Maurice Blanchot by Ulrich Haase and William Large, published last year, is a profound and miraculously lucid guide to the French writer’s work. This year we have Timothy Clark’s introduction to the work of a major influence on Blanchot: the German philosopher Martin Heidegger (1889-1976). The high quality is maintained. Undoubtedly, this has a great deal to do with the subjects. Both writers are not only seductively poetic, but make of poetry itself something much more than is commonly permitted. Yet there are innumerable introductions to Heidegger, and a growing number of works on Blanchot. What makes these significant is the series’ focus. Routledge’s general subtitle is “Essential guides for literary studies”. While this would seem limiting, or merely instrumental to passing an exam, it in fact reminds us of the true fascination of philosophy and literature; not as means to an end, but a necessary presence. If this is the case, then the demand for an historical context is part of the “unavoidable heritage into which we are all born”. It confirms to us, before an alternative view has a chance to be heard, that our assumptions are correct. As a consequence, Heidegger can be placed into a safely distant past, his ideas categorised, filed away, to be quoted later in an airy repudiation. This is exacerbated in Heidegger’s case by a large dose of political infamy. We’ll come to that later. “intensification and hardening of ‘theoreticism’, the drive toward technical and objectifying modes of knowledge and, with it, the oblivion of any more primordial or more reverential kind of existence”. This shouldn’t be too difficult for us in the 21st Century to recognise. What is higher praise or justification now than “it is scientifically provable”; and what is sterner criticism is there than to be labelled “unscientific”, “irrational”? Ancient Greek philosophy is not as ancient as we might imagine. If Plato is the beginning of Western thought, then that beginning, Heidegger says, is still with us. Indeed it is “before us” like a predestined future. We still see the world as an object of knowledge to be understood, manipulated and utilised. It is an anthropocentric attitude that has profound consequences. Heidegger claims it set us on course toward nihilism. Eventually, everything is geared towards selfish aims with no regard for the earth or the people in it. This seems to contradict our faith in progress. As while we celebrate humankind’s progress in science, medicine, technology, culture, we also lament the sublime disasters that have interrupted it. Yet “interrupted” is one of those evidences of “self-evident” truths we adopt to avoid the possibility that these disasters were a necessary part of “progress”. Slavery, Imperialism, World War I, the Holocaust, Stalinism, among many others: these terrors inflicted upon the world are excused as atavisms we must resist when perhaps, instead, they were, and will be, inevitable. This was recognised in the early part of the Twentieth Century and led to a crisis in confidence with the logic of Western Civilisation. We can see it in the Modernist crisis in the arts. While cultural critics (such as the lamentable John Carey) blames Modernism on a few privileged writers’ opposition to mass emancipation, Heidegger widens the cause to two Millennia of history! Interestingly, this critique correlates with Gabriel Josipovici’s in his book On Trust. There, Plato’s dismissal of Homer is seen as a watershed in literary history. He saw The Odyssey and The Iliad as part of a tradition of mystification keeping us from the light of reason. Since then art shrunk to only a medium of aesthetic pleasure, a distraction from the Real World. Heidegger says art died (and turned into aesthetics and business) because it was unable to preserve its “world-soliciting force”. This means the work NOT as a re-presentation of the world but as the revelation, the disclosure, of that world in the first place. Heidegger detects such a disclosing force of Greek temples (see his famous essay “The Origin of the Work of Art”). But it also applied to the other arts. Both Josipovici and Heidegger analyse how writers managed to cope with the death of art. While Josipovici looks at a range of works from the Bible to Samuel Beckett, Heidegger focusses on the major German poets: Hölderlin, Stefan George, Rilke, and even Paul Celan (who was also a student of his work). Clark says that Heidegger was interested in these writers not because they wrote about nihilism but because “poetry is itself a mode of language that engages [nihilism] by enacting the possibility of other, non-appropriative ways of knowing”. But if these poets renewed art, it is clear that it is, in its Lazarus state on the web and marketplace stall, still close to death. Literature has been appropriated by the very forces it should be resisting: technology and capital. Clark’s book is welcome in reminding us that there is more to art than lifestyle accessory or a alternative social commentary. Instead, at it best, art “presents its own unique and ultimately inexplicable mode of being, something for the reader, beholder or listener to dwell within and not merely something to decode.” Blanchot defines the true artist as he or she who can “see the potential disclosive force of a work, and to follow it through” rather than one with all the accepted craft techniques and friends in the Media. So where might this disclosure of the world lead us? Well, there are dangers. Heidegger made a telling misjudgement when he made a speech, in 1933, as Rector of Freiburg University, praising Hitler and the Nazi Party, which he had just joined. He announced the beginning of an emancipation from two thousand years of gathering nihilism. Of course, Nazism was the very embodiment of that nihilism, and Heidegger soon resigned as Rector. But one has to wonder whether there isn’t something inherently destructive in the idea of “another life” even after we have rejected that offered by religion. 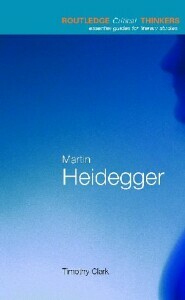 There is a shelf of books dealing with Heidegger’s short political life and its relation to his philosophy. Clark summarises the debate without diminishing its import. I was struck by the idea that anti-Semitism, to which Heidegger paid lip service, was due to Judaism’s inherent challenge to the Platonic project of Modernity; it retains an ancient relation to the finitude of life and knowledge. Clark isn’t convinced by this idea, but it certainly helped me to understand why a disproportionate number of the great European writers and artists are Jewish: Kafka, Proust, Benjamin, Celan, Appelfeld. Otherwise, it is easy to assume these writers are deemed great by the aura of the Holocaust or by some tortured Outsider status. I’ve never accepted this. Perhaps such an assumption is a natural outcome of Plato’s attitude to literature; that the work itself is never significant in itself. It would take a raft of great critics to articulate how the specifics of these writers’ work disclose the deep history of Western Civilisation as it enters a third millennium. But reading the work in the first place is the important thing. One great critic of the last century, perhaps the greatest, the aforementioned Maurice Blanchot, developed a Heideggerian approach to literature in The Space of Literature (a breathtaking book by the way) which Clark quotes regularly. It is particularly interesting when dealing with Heidegger’s notion that our alienation from nature is due to instrumental theoreticism, and that only poetry can redeem the situation. For Blanchot, rather than a “homecoming” to the earth as Heidegger saw it, “the [poetical] work does not enter … the realm of meaning, disclosure, cultural debate and truth. It remains with the darkness of the earth.” Whilst remaining with Heidegger’s radical revision of the possibility of art, Blanchot makes it much darker. Art may not be dead but we are exiled from it. Only a violent misappropriation can bring it into the Real World. Yet that is precisely why artists like Kafka, like Celan, like Aharon Appelfeld are worth reading, and the literature of the instrumental moment not at all.